The 5th annual Spark! Challenge was larger than ever with 74 Northwell teams, and 900 students participating throughout the year! Students from high schools across Long Island, Staten Island, Westchester and New York City were able to directly experience and explore the wide variety of careers available in healthcare. By connecting students, educators, and Northwell Health professionals, the Spark! Challenge is helping to reach, engage and inspire students to consider some traditional and non-traditional healthcare careers. We talked to Northwell team members who hosted students at their sites, as well as the teachers of the visiting schools to hear how the Spark! Challenge makes an impact on our students. 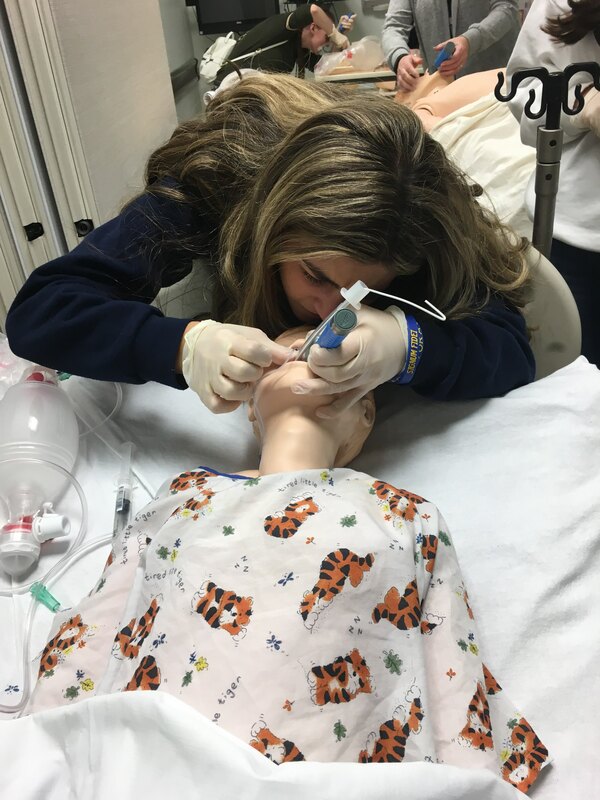 At Staten Island University Hospital’s (SIUH) North Campus, students from St. Joseph Hill Academy participated in a mock trauma with life-like mannequins. After exciting tours of the OR and ICU, students also had the opportunity to meet and talk with the surgical team. Students from Mepham High School partnered with local EMS services for a demonstration of a distracted driver with an overturned vehicle. 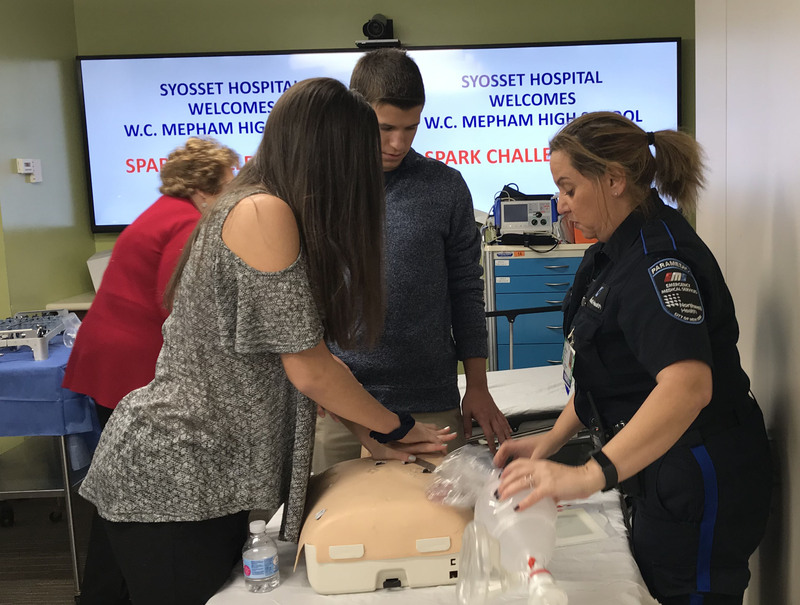 With help from the EMS team and Syosset staff, students extracted “patients” in a hands-on scenario, then toured the emergency department and ambulance. Plainview Hospital’s Spark! Challenge visit gave Bellmore-Merrick CHSD students an interactive experience in the Food & Nutrition Department. From culinary arts and menu design to clinical nutrition and planning, students received an introduction to the culinary world in healthcare before ending the day with a cooking competition. 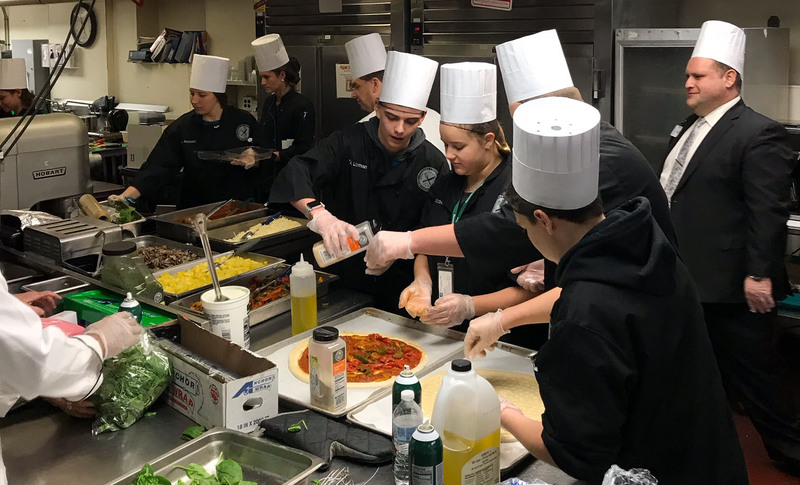 At North Shore University Hospital, students from Baldwin High School learned about all of the different career opportunities that exist within nutrition and culinary. Team members led them in a tour of the department before challenging them to cook a healthy meal. At Northwell Health, we’re committed to the health and wellness of not only our patients and the communities we serve, but our team members as well. Food is a foundation for maintaining good health, preventing sickness and maximizing clinical benefit. To help our staff learn the power of healthy food, Northwell has established free teaching kitchens across our healthcare system. Teaching kitchens combine culinary instruction with education to help participants learn which foods they should be eating more or less of and the best techniques for cooking them. Our nutrition education covers various topics including heart health, low refined sugar and high fiber. Team members are encouraged to use the same healthy and whole ingredients that Northwell chefs are using in our hospitals’ kitchens. And these aren’t your typical meals! Recipes include everything from one pot Italian quinoa to Asian lettuce wraps with avocado cilantro slaw. “We receive a lot of positive feedback,” says Katrina Hartog, MPH, RD, CDN, CHES, clinical nutrition manager, “but the most satisfying is when a participant says they’ve never tried the featured food or item, then walks away with the recipe to make it at home and sends their colleagues to participate!” The teaching kitchens have grown in popularity, and are also leveraged for for internal team building events as well as community outreach. These lessons are just one of the education tools organized by the Food & Nutrition teams to expand cooking confidence and nutrition education for Northwell employees. Other initiatives include recruiting and developing chef and dietitians, implementing Northwell Healthy Choice nutrition criteria and staff education. Syosset Hospital Chef Russ Ficke has had a transformational healthcare journey as part of our team. He’s lost 50 pounds by exercising and looking at food in a different way. His drive to make healthy lifestyle changes and better food choices have also helped him become even more passionate about his work as a hospital chef. That’s why we couldn’t wait to share his perspective on our wellness initiatives, get the scoop on the quality of chefs Northwell Health is looking to hire, and hear his advice for those starting out in the culinary industry. What’s it like to be Chef at Syosset Hospital? It is a real honor to be able to care for people who are giving you the opportunity to make them healthier. Most of our patients at Syosset Hospital choose to come here for a procedure. They selected us over many other facilities. We must rise to the occasion in service and hospitality in every instance. What advice do you have for someone just starting out in a career in your field? Work hard and learn every aspect of the culinary industry — beyond dining, travel and tourism. I have worked in fine dining, catering halls, country clubs and hotels. I also taught Culinary Arts at a vocational school. There are many institutional facets of this industry. By accumulating knowledge of these various business lines, I am a more rounded chef. What should people know about your team? How does this speak to the quality of chefs that Northwell Health is looking to hire? I am grateful to work with a group of professionals who share the same focus: providing world-class service to our patients, visitors, and coworkers. I partner with my leadership team, as well as with the clinical nutrition team, to assure we are delivering the best service. I spend a lot of time with my culinary team teaching them new techniques, trends, and skills. I even learn things from them. What is Northwell’s Ultimate Chef Competition? 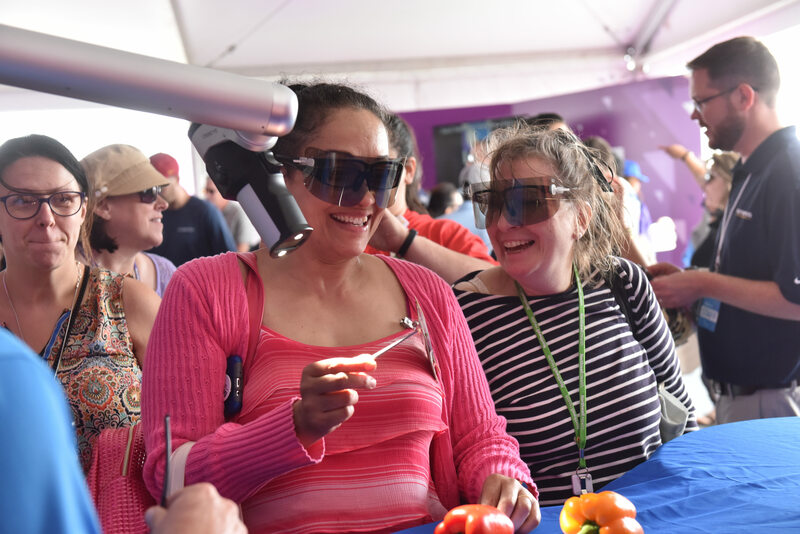 Chefs from 17 of Northwell Health hospitals have competed in the Ultimate Chef Healthy Cooking Competition for the past seven years at Glen Cove Hospital. Chefs are challenged with serving up delicious, restaurant-quality meals, but without the added high fat, calories or sodium. I have three first-place finishes and a third-place finish. For the past two years, I’ve helped run the event instead of competing in it. Each appetizer and dessert had to be less than 250 calories with no more than 250 milligrams of sodium and less than 35 percent total calories from fat. Entrees needed to be under 450 calories, with no more than 500 milligrams of sodium and 35 percent of total calories from fat. Teams are also sometimes given a mystery ingredient to incorporate into their original three-course meal. How do you as a Chef promote Northwell Health’s commitment to wellness? Northwell health is committed to providing healthy meals and options to our 66,000+ employees. This focus on wellness extends from our patients to our cafeterias and internal catering, all the way to our vending machines. We also provide educational sessions and cooking classes around these initiatives to promote healthier nutrition. What is something that people should know about Northwell Health as an employer that they might not know already? Northwell Health values and promotes many different training opportunities to assist us in our career growth. I am fortunate to work for an organization that invests in me. Like what Chef Ficke is cooking up at Northwell Health? Join our passionate and growing culinary team. Explore job opportunities today! At Northwell, we’re flexible and not afraid to push boundaries. 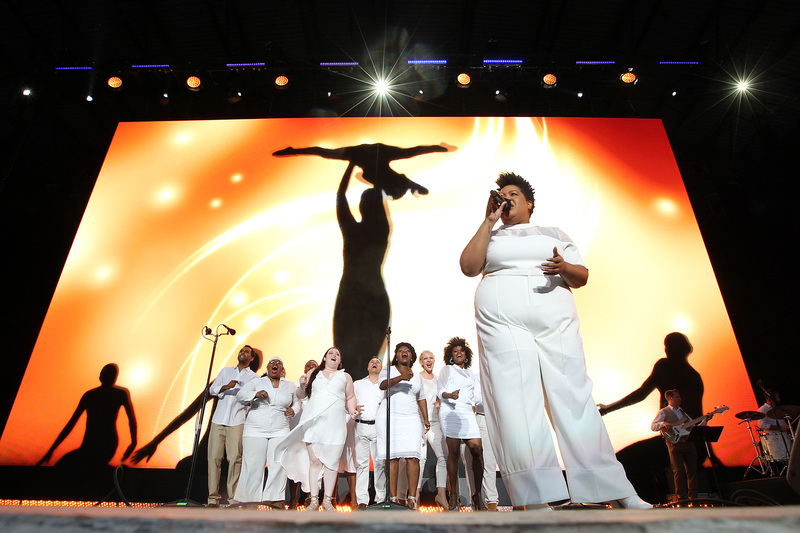 So, the forecast and eventual onset of rain that showed up at the finale of this year’s employee Rally didn’t stop our team members from making unforgettable memories together and celebrating the “Story of us.” There was nothing but sunny and smiling faces at the Northwell Health at Jones Beach Theater on Saturday, July 21 when thousands of Northwell team members gathered for this incredible event. This year’s Rally was all about storytelling and started at the Wellgate, our healthy version of a tailgate. 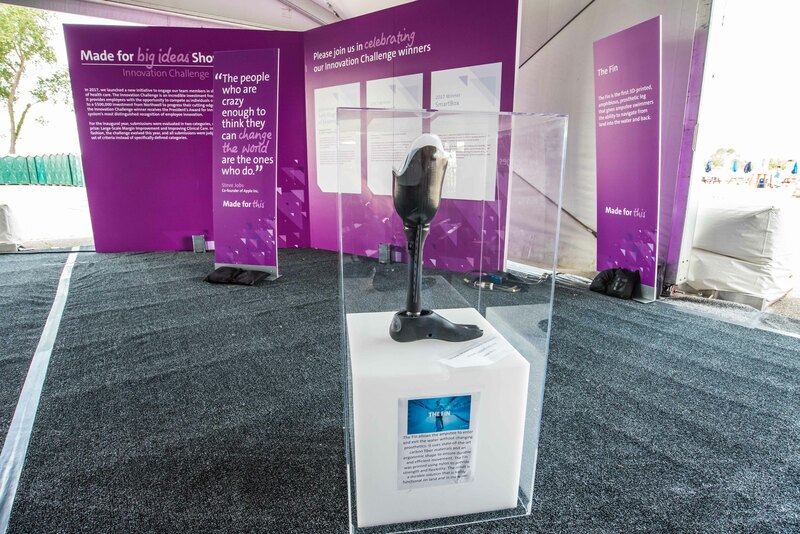 In the “Story of Us” zone, guests could visit “Did You Know?” tents to learn about different initiatives for Northwell team members– such as myWellness, the Gift of Life (Northwell’s organ donation partnership program) and the work of our Foundation (we are a non-profit after all). It was in this zone that Northwell even beat a world record! Rally guests worked together to help Northwell break the Guinness World Record for the most color by number contributions. 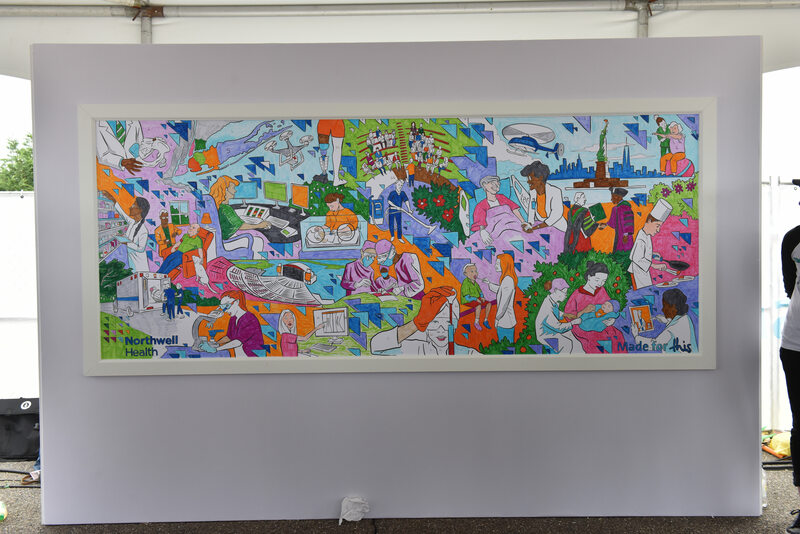 829 participants colored in a giant mural depicting our health system, beating the previous record of 455 participants. In the “Story of Life” zone, Rally guests experienced the power of connection. Here guests could taste healthy choice recipes crafted by 12 Northwell chefs from our hospitals. 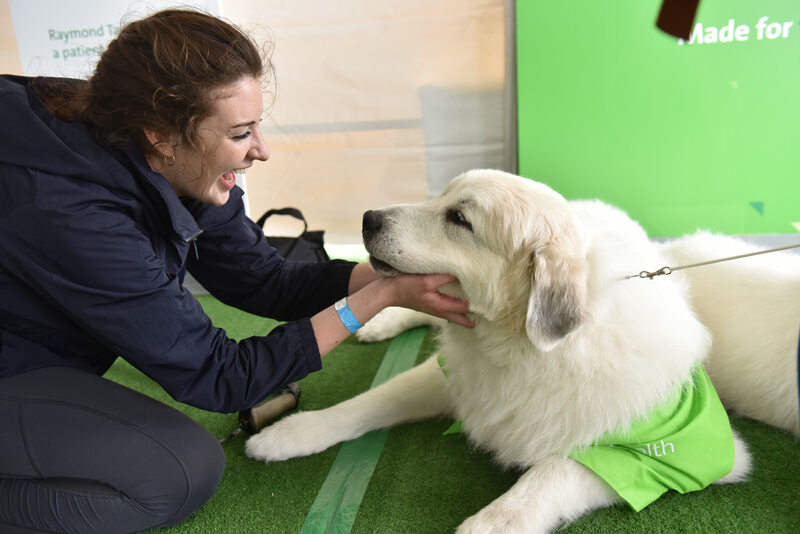 They also discovered the healing power of pet therapy, getting the opportunity to meet with Northwell’s furriest team members. Poetry was also part of the day, with poets writing a personalized haiku for guests based on their own stories. Rally guests could then walk through the different features highlighting our “Stores of Curiosity”. Guests could participate in training in an ambulance simulator or support one of Northwell’s next innovations by signing the “What if” wall which gave an inside look into some of our health system’s next big ideas. The zone’s Hall of Innovation was another big hit at the Rally. From a telehealth bike that gives patients access to supervised pulmonary rehabilitation therapy remotely, to a Northwell Health skill for Amazon Alexa that delivers current wait times for our patients, Northwell’s team members are developing innovations that will help shape the future of health care. Other featured initiatives included: the Fin (the first 3D-printed, amphibious, prosthetic leg that allows amputee swimmers to navigate in and out of the water), Bottle Cap (an app that provides patients with automated text messaging and online coaching to learn about and reduce their consumption of alcoholic beverages,) and Project Polaris (a multi-year journey to reimagine HR processes). In our “Stories of Celebration” zone, we celebrated our diverse and growing team of more than 66,000, including the stories of our President’s Awards winners and finalists, service awards recipients, and those who volunteered for service in last year’s Hurricane Harvey and Maria relief efforts. Our employees are so much more than their scrubs and stethoscopes and Rally guests were able to look, listen, touch and feel the exceptional stories of their fellow team members in our immersive display celebrating Northwell’s every day heroes. Finally, at the Activity Stage, employees moved to the beat at the Zumba class led by a Northwell team member, Daniel Manalo, and danced to the music of the Hot Seeds, our very own physician band. After the Wellgate experience, attendees entered the amphitheater for the main show, an experience that won’t soon be forgotten. 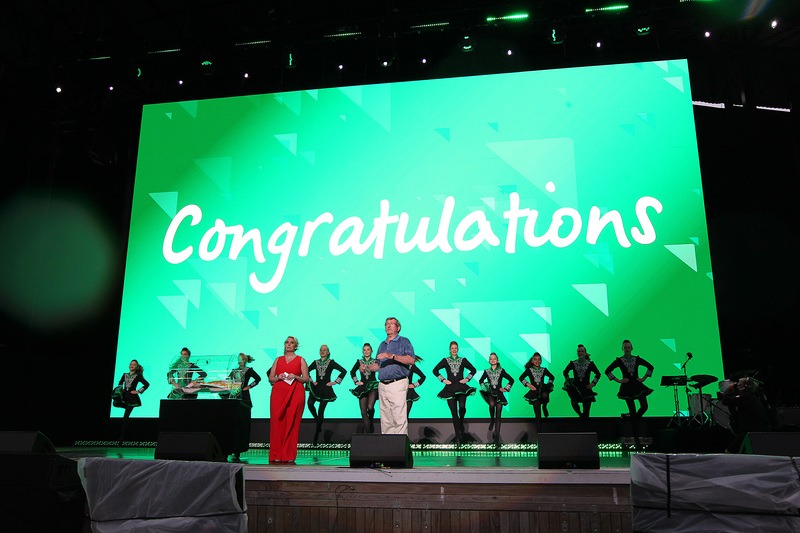 From a guest speaker to President’s Awards Winner tributes to the grand prize drawing of our employee walk challenge to special performances, team members danced and cheered all night long. It of course wouldn’t be a Rally without Michael J. Dowling, Northwell’s President and CEO. It’s not often your CEO make their big entrance on a boat! His remarks, as always, inspired everyone in attendance and he reminded team members to continue to innovate for our patients and our community. Advancing Northwell’s spirit of innovation was the Rally’s guest speaker, Mick Ebeling. Mick founded Not Impossible Labs and works hard to expand the possibilities of technology to provide solutions for fundamental human needs, causing waves in and out of the world of healthcare. His powerful speech inspired Northwell employees to continue to view the world differently and to challenge the idea of impossible. Closing the 2018 Northwell Rally was a spectacular performance from Michael Elroy and the Broadway Inspirational Voices and a moving display from The Silhouettes. The excitement in the air was contagious, with team members feeling reinvigorated for what lies ahead. Of course, the excitement was never higher than when it came time to announce the big winners for the Walk to Dublin employee step challenge. The winning team was announced, with all ten members receiving a free trip to Dublin. But that wasn’t all – as a surprise, two more teams were awarded the grand prize for a total of thirty employees headed to Dublin! As the event came to a close, there was one impassioned thought running through the crowd: we can’t wait to see what the Story of Us brings next year! Are you Made for a career at Northwell? Explore current job opportunities across our health system. Watch the Rally Recap Video for a glimpse of the day and incredible moments that unfolded! Hospital cafeterias serving fresh, local, nutritious meals? Now, that’s an ambitious order. Under the bold and delicious vision of Northwell Health’s VP of System Food Services Corporate Michelin Chef, Bruno Tison, the recipe for hospital food as you once knew it has changed. 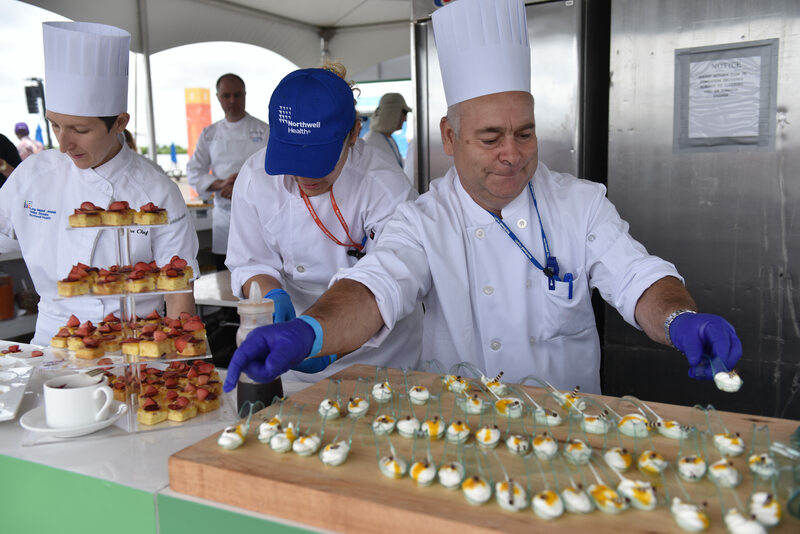 Michelin Chef Tison, along with other award-winning Michelin chefs like Andrew Cain, is helping Northwell Health redefine the culinary experience for patients, their families, and Northwell employees. A recipe for culinary success. A native of northern France, Chef Bruno Tison began his culinary education at Belgium’s prestigious Institut Technique Des Metiers De L’Alimentation, where he graduated with highest honors and was awarded first prize for excellence in culinary achievement. His more than 30 years of experience includes serving as Executive Chef of the legendary Plaza Hotel in New York City. Chef Tison’s nouvelle cuisine has earned critical acclaim. Most recently, his leadership enabled the Fairmont Sonoma Mission Inn and Spa in California to receive the celebrated Michelin Star recognition for three consecutive years. Chef Andrew Cain started working under an executive chef at the age of 15, received a Bachelor’s degree in Hotel Restaurant Management and went to work at the Fairmont with Chef Tison 10 years ago. They’ve made a great team ever since. This relationship is now helping to dramatically elevate Northwell Health’s food experience. Having reached the pinnacle of the culinary profession, Chefs Tison and Cain were looking for a new challenge and the opportunity to bring the highest level of culinary expression not just to people who could “afford it” but to people who truly needed it, people whose lives could be changed by a world-class food experience. Bring outstanding talent from the outside and retrain existing chefs. Having worked with Chef Tison for 10+ years, Chef Andrew Cain shared his passion for elevating the food experience for people who genuinely need it. With a background in Four- and Five-Star restaurants in New York, San Francisco and Washington, D.C., Chef Cain is helping Chef Tison bring a Michelin-inspired sensibility to Northwell Health. Northwell is also partnering with the Culinary Institute of America to attract the next generation of great chefs. Knowing that Northwell is a place known for the most innovative clinical technology, Chef Tison is bringing this same commitment to modernizing the food service area. This includes fresh, locally-sourced food instead of frozen, replacing instant coffee with fresh coffee, getting rid of candies/sugar and eliminating processed food. Chef Tison’s ultimate goal is to deliver restaurant-quality food to patients, families and staff. “It’s a new frontier,” says Chef Tison, “and that’s exciting for new and tenured chefs alike.” He even has an eye on applying for inclusion in the Michelin Guide! 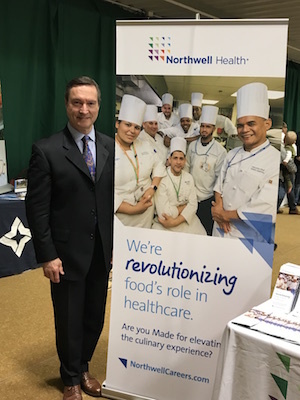 If you’d like to be part of an organization with this kind of bold, visionary leadership, take a look at Northwell Health Careers in Food Service. At Northwell Health, we already stand out as one of the Best Workplaces™ in Health Care and Biopharma. Now we’re aiming to be the healthiest. Our leadership is focused on food and nutrition as well as fitness and mental wellbeing initiatives to build a healthier workplace for all our employees. It all starts with the ingredients. Over the past two years, we’ve worked to ensure that our chicken, turkey and beef burgers are 100 percent antibiotic free. Our fish is sustainably sourced and harvested and we work, as much as possible, with local farms across Long Island, NJ and the Hudson Valley to source local produce. Through Community Supported Agriculture, employees are given the opportunity to get local produce – freshly harvested that morning — delivered weekly to their offices. With great ingredients, we need great chefs. Northwell Health has four Michelin Star chefs that are driving chef talent development including our new AVP, system food services Bruno Tison. Our new partnership with the Culinary Institute of America’s fellowship program is going to bring culinary students into our pipeline of talent. Now that we have put wellness on our plates and in our kitchens, we’re focusing on wellness in other areas. For starters? We want employees to be eating well at home. So, we’ve invested in teaching kitchens and work in close collaboration with chefs and registered dietitian teams to create hands-on demonstrations that have become a popular, accessible tool for staff. And we’re supporting these initiatives by providing healthier options throughout our facilities, not just the patient and cafeteria menu. We’re updating our coffee shops, gift shops, and vending machines so that the default options at our facilities will be healthy ones. Though these changes are already making an impact to our employees’ wellness, they’re not the only lifestyle initiatives that we’re putting in place to support the wellbeing of our people. We’re putting our best foot forward through on-site stairwell and fitness campaigns and corporate walking challenges like our Walk to Dublin contest. As we pursue promoting wellness for our bodies, we also seek wellness for our mental health. We offer opportunities for stress management at our sites through guided meditation and reiki, and simply giving our employees time to unwind. We’re also making our facilities mom-friendly. By August, all of our sites will be equipped with dedicated lactation rooms to make pumping at work more accessible and comfortable for mothers. At Northwell, every role matters, every person matters and every healthy moment matters. We’re invested in our employees’ health, inside and out and we continuously strive toward making our facilities a more nutritious, fit-friendly and welcoming place to work. Be part of this transformation. See where you fit in here.